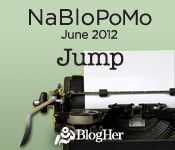 NaBloPoMo stands for "National Blog Posting Month" and is a blogging challenge created by the folks at BlogHer. Is the proverbial glass half empty or half full? Neither. We need blessings and trials in order to grow personally. I understand that life brings amazing opportunities. But I also understand that although painful at times, if I focus and work hard I will grow stronger.